“At times like these families should be coming together, not tearing each other apart. On her remote North Queensland cattle station, Ivy Dunmore is facing the end of her days. Increasingly frail, all she holds dear is threatened not just by crippling drought, but by jealousy and greed – and that’s from within her own family. At its heart RETURN TO ROSEGLEN is a story about the ‘sandwich generation’ of women who juggle careers, adult children, maybe even grandchildren, menopause, mid-life changes, and their ageing parents. It’s also a tribute to the generation of women who lived through World War 2 and lost loved ones, but who soldiered on, raised families, built communities and survived to a grand old age. It’s about the battle to maintain their place in the world as their joints begin to stiffen, their eyesight dims, their world shrinks and they become dependent on their children as the roles reverse. It’s something we as a community need to talk about and guard against. I hope that RETURN TO ROSEGLEN helps that conversation along. To assist with that I have two sets of five books to give away for books clubs. To enter the draw you need to tell me about your book club, how often and where you meet, and why you’d like to read RETURN TO ROSEGLEN. There are a few ways you can enter. You can leave a comment on my FB post or other social media platforms. Or you can send a message through the contact form on my website. I’ll pick two winners on 16th June and will then post the parcel of five books out to your nominated address. I’d love to see photos of your book club group reading the book as well!! 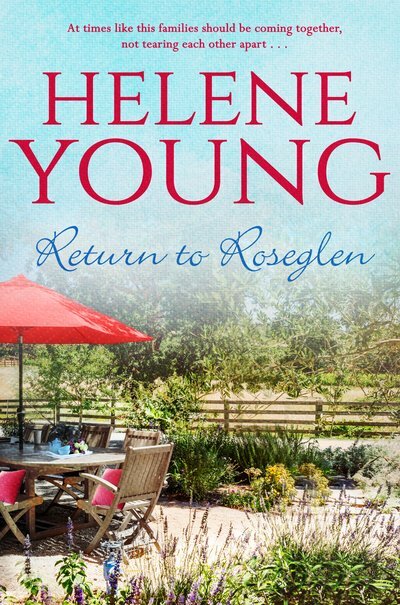 I’ll have another competition once RETURN TO ROSEGLEN has been released for book clubs – something a little different – but I’ll post details of that a little later. And of course there will be more opportunities to win advance copies of the book. Meanwhile you can pre-order RETURN TO ROSEGLEN with any good booksellers and at the following links. Blog Australian Author, betrayal, book clubs, Book Giveaway, Elder Abuse, Helene Young, Penguin Books Australia, Return to Roseglen, sandwich generation, women, Women's fiction. permalink. The Book Babes from Melbourne. Both winners will be notified via their emails and I hope both book clubs enjoy reading Return to Roseglen! Can’t wait. Will you be doing a signing in Cairns? I know only too well about family betrayal and manipulation. Sadly it’s happens too often. I can’t wait to read another one of your fabulous books! It’s far too common, Jaye, and I do hope you enjoy Return to Roseglen. You’d also know that nervous wait when the review copies are sent out into the world! I’d love to win this for my book club. I’ve had lots of fun the last couple of months discovering new Australian authors. That’s great, Meleese, how often do you meet? I’d love to hear more about how you choose the books you discuss! My ‘book club’ and I meet on the phone a couple of times a week… Aunty Maureen 🙂 I will enter on her behalf. Congratulations on the new book! Exciting days! Gorgeous Aunty Maureen is in a special category of her own, Annie!! Congratulations Helene, love the cover. Ann. Our book club is called The Bay Book Club we are at Nelson Bay NSW. We meet between 4-6 weeks depending on how large the book is. We all do bowling on Mondays so we meet there or we go out for lunch. I would love for our book club to get your new book as I have personally been hanging out for your latest release and when I have just came across it I was very excited to learn it won’t be long until it is released!! Love your books Helene!! That sounds wonderful, Judy, and you live in a beautiful part of Australia! And I’m so glad you’ve enjoyed my books. Thanks for patiently waiting for this one to arrive! The Bay Book Club is in the draw!! My bookclub meets once a month. We each have a turn at picking the next read. This way we get to read a variety of genres but we generally have very similar tastes. The person that chooses the book gets to write up some questions that lead the discussion at the next meet. That sounds like a great way to discover new authors, Veronica. And having one member lead the discussion means everyone will have their say! I’ve included questions in the back of Return to Roseglen. It’s something I’ve wanted to do before, but this is the first time it’s happened so hopefully that will help start the discussion for readers whether they’re in a club or not. Thanks, Joanne. I do hope you enjoy it! Have pre ordered hanging to read it. Love your work keep it up. Hope not too chilly down south tonight. Thanks so much for that, Julia. It’s a glorious day in Geelong today but feels like another cold night! Thanks, Vanda, it’s been a long wait and I’m thankful readers have been so patient!